Where do the Engagement Accelerator’s results come from? A: The Engagement Accelerator is based on over 30 years of insights and conclusions by noted employee engagement thought leader and author Bob Kelleher and his team of organizational development practitioners. The Accelerator investigates 13 preferences to provide a snapshot of an employee’s engagement. The assessment has been through multiple rounds of pilot testing and subsequent edits by employee focus groups (employees and supervisors) to validate the insights of the 13 preference questions. The Accelerator is an employee engagement and organizational development experience which fills a niche not occupied by traditional personality or behavioral tests. The Accelerator has been tested for more than two years with focus groups of various sizes and determined to be over 96% accurate. Can the Engagement Accelerator take the place of a performance appraisal? A: No, but it can be a terrific complement! Many organizations are replacing the traditional annual performance appraisal with a more iterative series of “touch point” conversations throughout the year. The Engagement Accelerator provides an excellent platform to frame such conversations. Should I use the Engagement Accelerator as part of our hiring process? A: The Accelerator’s results have not been validated for the purpose of hiring. However, many hiring managers have suggested that the assessment could perform well as part of a suite of tools used to evaluate potential candidates, especially if the preferences of the role’s supervisor and close coworkers are known. Where is Engagement Accelerator data stored? Who can access it? A: The Engagement Accelerator’s data are stored on a secure third-party server. Results are shared with individuals and the manager whose email address is provided by the assessment user. The Employee Engagement Group administrators also have access to the results for the purposes of user support, aggregate benchmarking, and further product development. Individual and organization names on any case study data are anonymized to protect confidentiality. Is this version of the Engagement Accelerator final? A: No. As of November 2016, the 13-question version of the Accelerator represents our Version 1.1. (Previous versions served beta testing and pilot purposes.) Plans for future versions include further data depiction, including group and team assessments! How were the 13 questions derived? A: Building upon previously published research, The Employee Engagement Group’s extensive experience has shown (a) that engagement is not a fixed state, but changes over time with work and non-work circumstances and (b) that an employee’s relationship with his or her direct supervisor is the top determinant of how engaged he or she is. The 13 questions were developed and tested to isolate engagement and work style preferences not typically investigated by other tests, and to provide points for discussion to streamline and improve manager-employee communication. Are the results static, or will they change over time? A: As discussed in the question above, The Employee Engagement Group’s research has determined that employee engagement is a fluid state, subject to change based on roles, responsibilities, life circumstances, organizational flux, and relationship with one’s direct supervisor. As such, the assessment is designed to be taken on multiple occasions over time, with slightly different results as individuals’ preferences evolve. 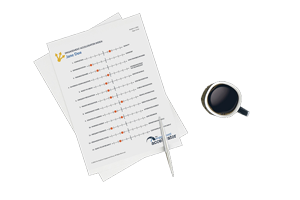 Do you recommend sharing Engagement Accelerator results as part of a group or teambuilding exercise? A: To encourage trust and participation, we recommend that managers confine results to one-on-one conversations with individual employees. However, we anticipate that some organizational cultures may have interest and support in comparing results. Because the Engagement Accelerator assesses preferences rather than skills, behaviors, or competencies, it is a low disengagement risk for team exercises. However, The Employee Engagement Group cautions against this use without first establishing buy-in from all participants. How will the results be used by my organization? A: The Engagement Accelerator is intended to provide insight into personal engagement for both self-reflection and heightened understanding between direct supervisors and their employees. While it has been designed to assess non-sensitive areas of preference, we recommend that organizations implement the assessment as a confidential exercise between managers and employees. When should I introduce the Engagement Accelerator? A: Our trials have shown that the Engagement Accelerator can optimally be used to track engagement for individuals annually. It also provides a useful snapshot of engagement during changes to roles or responsibilities, new team formation, supervisor rotation, or departmental reorganization. Organizations have found the Accelerator to be a useful complement to performance appraisal/career development discussions as a mid-year touchpoint. How will my results be used by The Employee Engagement Group? A: The Employee Engagement Group has the highest commitment to company and employee confidentiality. We reserve the right to aggregate anonymized results for the purposes of further research and product development.